You are here: Home / Misc. / Education / HBCU vs PWI; Which is better for my Kid? 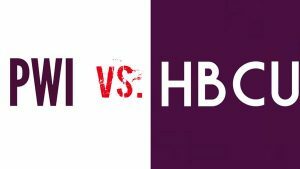 HBCU vs PWI; Which is better for my Kid? (ThyBlackMan.com) I am sure that you have seen the viral video of an unidentified black female student being escorted out of a class at the University of Texas at San Antonio by law enforcement officers. Her offense was placing her feet on the chair in front of her during lecture. This matter resurfaced an issue that is often discussed behind closed doors by a cross-section of Black America. In many ways, the alluded to discussion pivots along a simple question, should black parents send their children to predominantly white institutions (PWI) or Historically Black Colleges and Universities (HBCU). As a graduate of THE Ohio State University, others often ask why did I choose to attend a predominantly white institution. Most consider it an even more unusual choice after learning that I earned two degrees in African-American Studies and now serve as an African-American Studies Professor at an HBCU. Although I often muse that my time at THE Ohio State University was not the typical experience of a black student at a PWI; on that campus, Black Studies students association with black scholars and intellectuals served as a psychological buffer against many of the more gross expressions of white bigotry. However, it would be at best a half-truth to say that black students were able to share close quarters with whites. It was my experience with whites at THE Ohio State University that brought forth unforgiving portions of my personality and birthed an edge to my demeanor. I learned early in this process that black students at a PWI have paths available to them. They must instantaneously decide if they will allow themselves to be devoured by whites (professors and classmates) or will they stand firm against whites omnipresent micro aggressions designed to whittle away their being. Unfortunately for Black America, the former is more common among defenseless eighteen-year-olds whose enemies are encamped all around them. The alluded to enemies feel that they are not only our intellectual superiors but also willing to outwork the most hard-working black student. I, like many of my friends, was determined to disprove such baseless conclusions. It is no stretch to assert that the students of my generation had taken to heart the teaching that we “would have to work twice as hard to get half as far” as our white classmates. In time, I came to understand that I was not only behind enemy lines at Ohio State but also severely damaged by the unspoken war being waged against black students. It is this undeclared war against black undergraduates by those they share space with on PWI campuses across the nation that informs my belief that Black America needs to have a serious conversation regarding where black students should be educated. The deplorable actions of a white professor who interrupted her lecture summoned the police and had a student removed for having her feet on a chair are far from shocking to blacks who have attended a PWI. Blacks realize that the alluded to aggressions are the application of a rarely discussed “black tax” that African-Americans — regardless of their age, educational achievement, or socioeconomic status — will be forced to pay at some point. It is this “black tax” that any white is capable of demanding as if they are asking for a “pass” from an enslaved African who they considered to be too far from his plantation “home” that long ago convinced me that black parents need to reconsider their belief that sending their child to PWIs is preferable to HBCUs that have historically served Black America. I can attest to witnessing brilliant undergraduates at THE Ohio StateUniversity be psychologically destroyed by what amounts to academic hazing by classmates and even professors. Conversely, I have seen less refined and sophisticated students at an HBCU nurtured, supported, encouraged, and challenged to the point that by the time they matriculated, the alluded to students were a finished product that soared to unconscionable heights. In a nation with a reliable correlation between increasing racial diversity and escalating prejudice, discrimination, and racial bigotry, it may be time for black parents to reject the thought of sending their offspring to PWIs and realize that it is the HBCU that is a more reliable springboard for their child’s future. Ultimately, it comes down to a personal choice that I refuse to view in a harsh light. However, I hope that black parents understand that if they decide to send their child to a PWI, they had better tell them to not put their feet on the chair in front of them as such an offense is worthy of arrest on those campuses. The university that has the best professors are the best for your child. Knowledge is not the sole possession of the black or the white professor or student.Students learn when the professor is able to communicate knowledge to them. There are black professors who shouldn’t teach at white or black universities because of their inability to teach, and white professors who shouldn’t teach at black or white universities because of their inability to teach. I highly recommend Howard University located in Washington, D.C. because many of their professors are able to really communicate knowledge to their students.